This truly is a new low even for the Hillary Campaign and support team. 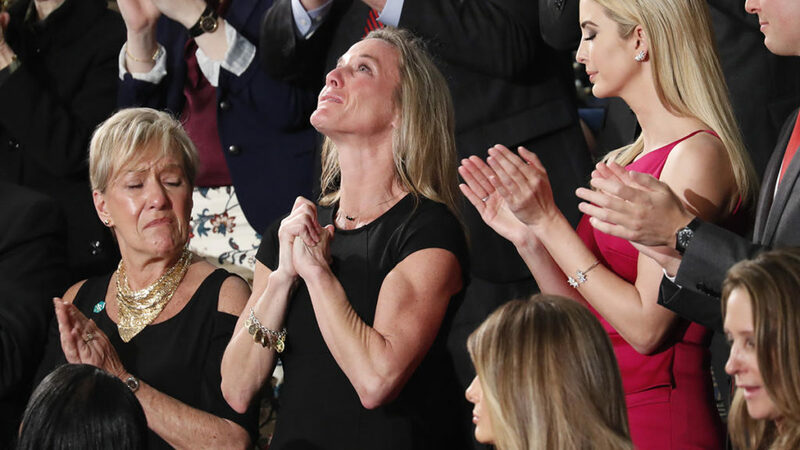 Carryn Owens in the Wife of the late Ryan Owens, a Navy SEAL who was tragically killed a month ago. He died a hero, sacrificing all that he had for his nation. In Donald Trump’s speech in the chamber, he specifically drew attention to the sacrifice of heroes like Ryan Owens. It was a powerful moment and the entire audience was clearly very touched and humbled by the mandate to care for those who have cared for and protected us. “Our veterans have delivered for this nation—and now we must deliver for them,” The entire audience stood emotionally in applause at this moment. “Ryan died as he lived: a warrior, and a hero – battling against terrorism and securing our nation,” Trump added. It was a powerful moment, but somehow someone was able to find fault with the moment and turned nastily on the widow of Ryan Owens. And, Surprise! It just so happens to be former Barack Obama AND Hillary Clinton volunteer, Dan Grilo. “Regardless of whether the comments in the tweet were intended to cause the hurt and anger that they ultimately generated, they were unacceptable to us, and the individual who issued the tweet is no longer affiliated with Liberty,” the statement said. Good! To find a way to abandon basic humanity and condemn the widow of a man who died defending your country and home is so fundamentally classless and wrong.